When Master Hosier Edgar Carter shut and locked his workshop door for the last time in 1952, he left inside a unique relic - a time capsule of knitting frames, tools and the worsted gloves, mitts and hose he made. Private visits and organised groups at any time, by prior arrangement. Disabled access to ground floor and garden only, assistance given. 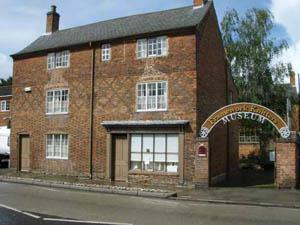 Admission to the museum is £2.50 for adults,and 50p for children. 4 miles south of Leicester on B582, off A5199.